Are you ready to hire? Connect to TRIEC's unique networks. Please fill out the form below. If you have any question, please contact our Employer Relations team via inquiries@triec.ca. TRIEC caters to the immigrant professional talent pool. Your job postings should list a minimum qualification level of an Undergraduate/Bachelor's degree and/or a significant number of years' experience in the field. This job posting platform operates on a pass-through model where the information goes out to several major networks of employment agencies; as such, TRIEC is not actively involved in the matching process, cannot modify or update a posting or provide a record of the jobs posted. Please provide TRIEC with your full company name and your acronym in brackets. E.g. 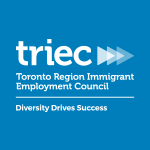 Toronto Region Immigrant Employment Council (TRIEC). Please enter the job description here. Kindly be mindful to copy and paste as plain text. Do you have an online link to your opportunity? If the opportunity is online, please provide us with the website URL to apply online. Please upload your job opportunity. We accept PDF and Word files. TRIEC will send you a confirmation email with a uniquely generated tracking number. All applicants are requested to refer to this tracking number. We recommend you note down this tracking number for your records.